The last few weeks have seen a groundswell of support for Kevin Zelnio’s #IamScience movement, what began as a single, incredibly heartfelt post and twitter hashtag evolved into a series of personal reflections, a somber music video, and a tumbler and Facebook page, all with the unifying message that there is no traditional path through science, only your path through science. In the spirit of the #IamScience and This is What a Scientist looks like movement, I’d like to present two photographs, taken more than fifty years apart, of the Duke University Marine Lab’s Marine Invertebrate Zoology class. 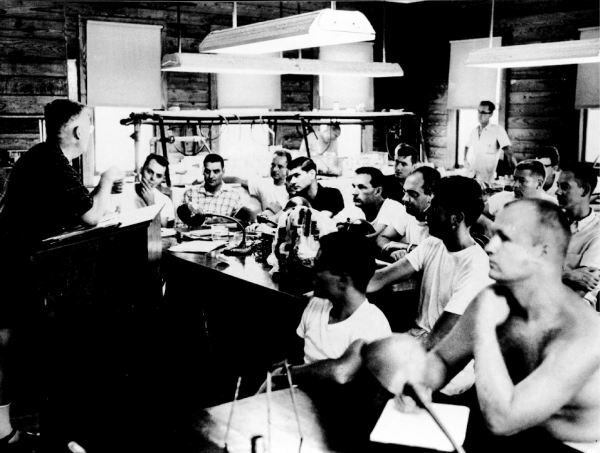 The first photograph, taken sometime in the mid-1950’s, features legendary marine biologist and director of the Marine Laboratory Cazlyn Green ‘Bookie’ Bookhout teaching his Marine Invertebrate Zoology class. 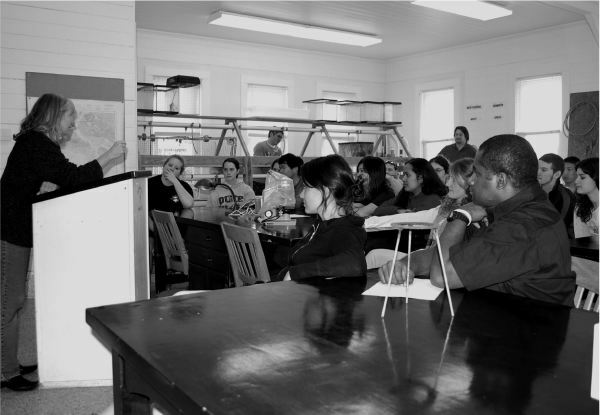 The second photograph*, taken in 2009, features legendary marine biologist and directory of the Marine Laboratory Cindy Lee ‘first scientist to pilot the DSV Alvin‘ Van Dover teaching her Marine Invertebrate Zoology class. This is what a scientist looks like. These are what future marine biologists look like. *Obviously we staged the second photograph to look like the first photograph (and I’m pretty sure that ring stand hasn’t left the lab in 60 years). We did bring in a few ringers (notably myself, Kevin Zelnio, William Saleu, and another lab tech) to match the 1950’s photo. I’m amazed that the d00d in the lower right corner/foreground of the 1950s photo appears to be shirtless. Didn’t think they tolerated that sort of tomfoolery in the squeaky clean 50’s! I was about to call that out too. Even in the 1950s marine science grad students were a breed apart.